Do you want a satisfying gourmet breakfast without the work? 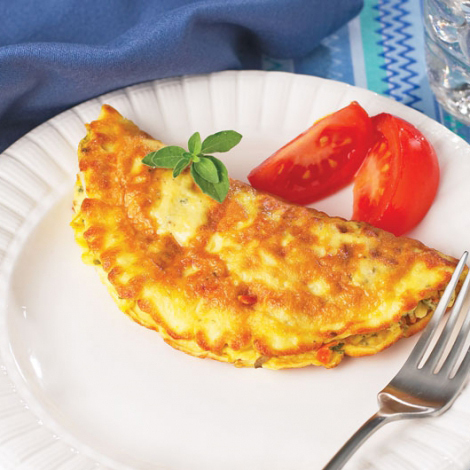 Bari Life Vegetable Protein Omelet Mix is a high-protein, low-carb quick breakfast that you can make on the stove or in the microwave. It’s so easy! No need to crack eggs or chop veggies. If you ever skip your breakfast omelet because it’s too much fuss, you’ll never have to worry again. Each serving has 15 grams of whey protein, 100 calories and only 3 grams of carbs! Now at any time of day, you can turn up the heat for a hot diet breakfast rich in protein! This low calorie breakfast of champions is complete with eggs, egg whites, parmesan cheese, mushrooms, red bell peppers and onions. Now, that sounds satisfying! All you need to add is water to enjoy it on its own, but feel free to toss in some extra veggies or spinach for a few more nutrients. Each packet is ready in minutes in the microwave or on the stovetop! Our protein omelets are suitable for the Pre Op and Post Op puréed, solid foods, weight loss and maintenance diets. Also a great choice for gastric sleeve, gastric bypass, duodenal switch and gastric band patients. Bari Life’s Vegetable Protein Omelet Mix is a savory breakfast dish containing 15 grams of whey protein, only 100 calories and no trans fat! Bari Life protein omelets are a fantastic morning breakfast option for anyone watching their weight and they are perfect for people on-the-go because they are light and easy to take with you anywhere. Especially great for camping and backpacking since they have 15 grams of filling whey protein! Great for breakfast, lunch or even dinner and snacks! For guidance on how to use this item as part of a healthy weight loss plan click here view our Bariatric Diet Plan. Whey Protein Concentrate, Eggs, Egg Whites, Natural and Artificial Flavors. Contains less than 2% of the following: Yeast Extract, Salt, Mushroom, Parmesan Cheese ([Milk, Salt, Cheese Cultures, Enzymes], Whey, Disodium Phosphate, Lactic Acid), Parsley, Beta Carotene Color (Maltodextrin, Gum Acacia, Sucrose, Vegetable Oil, Sodium Ascorbate, Beta-Carotene USP, di-alpha-tocopherol, silicon dioxide [anticaking agent]), Red Bell Peppers, Tomato Powder, Onion Powder, Garlic Powder, Spices, Sunflower Oil (anti-dusting agent), Soy Lecithin. You need to go back to the test kitchen when it comes to the omelets. OMG! one bite taken, couldn’t even swallow it. This was terrible. Add red pepper flakes to give it some spice!